Ten years after Robert Atkins's death in New York, his famous diet plan is still the source of unending controversy. If Dr Robert Atkins has instilled one message into the mind of the weight-conscious layman, it is this. A decade after his death you'll still hear people attacking bread, pasta and potatoes as the root of all rotundity. That's because the Atkins diet, first devised in 1972 but made famous by his second book, Dr Atkins' New Diet Revolution, in 2002, advocated a drastically reduced carbohydrate intake. Instead, followers of his high-protein diet could eat unlimited meat, eggs, cheese, fish and shellfish. Atkins said too many carbs raised sugar levels in the blood, which prompted the release of insulin, a hormone which increases the body's capacity for storing that sugar in the tissues as fat. He advocated starving the body of carbs so it was forced to burn its fat stores to get energy - a process known as ketosis. At the height of its popularity in 2003, about three million people in the UK had tried the diet. In the US, one in 11 was reportedly on it. Celebrity fans included Jennifer Aniston, Demi Moore and Catherine Zeta-Jones. Atkins's book was among the top 10 on The New York Times bestseller list for almost six years, selling in excess of 15m copies worldwide. There was a flurry of low-carb products such as low-carb beer and low-carb breads. In the US, sales of wheat and potatoes were reportedly hit by the diet fad, while meat consumption rose. But there were strident critics. Negative headlines included "High-protein diets 'damage kidneys'", "Atkins can 'put you in a bad mood'", "Obese patients warned off Atkins" and "Atkins could trigger diabetes". There were counter studies to the studies. Headlines like "Celebrity diet 'safe and effective'" and "Two studies indicate Atkins diet may help heart" epitomised the positive stories. Atkins's advice was controversial because it went against orthodox nutritionists who were recommending low-fat, high-carbohydrate diets. Even his death, in 2003, became a focus for controversy. Atkins died after a head injury sustained after slipping on a pavement but the state of his health was scrutinised for evidence of problems associated with the diet. The critics said a 2002 heart attack was proof of poor diet. Atkins denied this. Now, 10 years on, low-carb diets continue to divide. The NHS advice for healthy eating in the UK is that starchy foods - such as potatoes, cereals, pasta, rice and bread - should make up around one third of the food people eat. 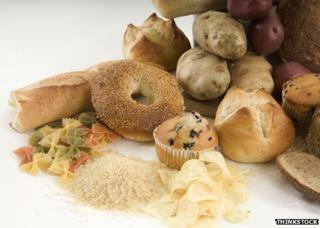 And the latest US dietary advice splits a plate into five food groups - fruits, vegetables, grains, proteins and dairy. "I've been dieting on and off since 2000. My whole family struggle with weight. "I try diets because I like to be told rules. Atkins was good because it allowed me to eat lots of nice foods. But it didn't work in the long term. I'd end up 'committing carbicide' and eat lots of bagels or bread. For a man to say that bread goes straight to my hips, it's probably an odd thing to say, but it's true. "Four years ago, I was 17 stone. I was out of breath chasing my daughter, who was aged one at the time, so I knew I had to do something. "My serious weight loss began in 2009 when I started running. By the end of 2009, I was 14st 7lb. "Currently I am on the 5:2 diet, so two days a week I only consume 600 calories. I still exercise, but it's the first diet that's actually helped me lose weight. I'm just under 6ft and apparently my ideal weight is 12st 10lbs. Now I'm 13st 10lbs. "I'm happy with how it is going but I know I need to find something that I can do for the rest of my life." But this orthodoxy has come under attack from some nutritionists. John Briffa, a doctor specialising in nutrition and author of Escape the Diet Trap, is one of those who sets himself against the likes of the British Dietetic Association and British Nutrition Foundation. He says there is an enormous amount of scientific research that supports low-carb diets - particularly studies which find them superior to low-fat, calorie-restricted diets for weight loss - and the internet shows "first hand accounts from countless individuals who have transformed their health for the better using low-carbohydrate eating". "Increasingly, this is what people are interested in, not the out-dated and unscientific views of their doctor, dietician, industry-linked nutrition organisation or government." Only last week, actress Gwyneth Paltrow provoked the wrath of the dietetic establishment while she was promoting her new low-carb, gluten-free cookbook, by saying she avoids feeding her children bread, rice and pasta. Critics said her children were "at risk of nutrient deficiencies" and "wouldn't be able to think straight". But the defenders argued there are no nutrients in starchy carbohydrate foods that people can't get elsewhere, and often in a superior form. Many nutritionists would agree Atkins works in the short-term. "People tend to have a rapid response when it comes to weightloss, but Atkins is also known to have one of the greatest rebounds, so people pile the pounds on when they come off it," says nutritionist and dietician Nicole Berberian. However many feel uneasy about a diet that, in the first stage at least, almost completely cuts out a food group (intake is limited to less than 20g a day). Others argue the stance simply isn't practical in the long run. Another persistent criticism is that low-carb diets increase the risk of heart disease, although defenders argue the science doesn't support this. Of course the Atkins diet isn't the only diet to have received mixed reviews. Ultimately, if there was a diet that really worked for everyone, the dieting industry wouldn't exist, let alone be a multibillion dollar one. "Like all diets, when it comes to Atkins, there is some truth in the rumour - there is some underlying scientific evidence - but proof cutting out carbs is the best way to lose weight just isn't there," says Sian Porter, a consultant dietician for the British Dietetic Association. She says many people are looking for a magic bullet, but there is no one size fits all solution. What's a healthy weight-loss plan? "Diets are fads, but it's about making permanent changes. Plus what you eat is only half the equation, the other half is physical activity," she says. There's been a slew of "name" diets, but the Atkins plan continues to be emblematic of the genre. The fact the man behind the diet was a doctor and had been very overweight gave him the "personal touch and the scientific 'validation'" in the eyes of many, according to Louise Foxcroft, author of Calories and Corsets. Porter says Dr Atkins also had the benefit of good timing. "His second book coincided with the internet, and the 24/7 agenda where everything is widely available," she says. However Paul Gately, professor of exercise and obesity at Leeds Metropolitan University, says the Atkins diet and other low-carb diets have also led to misunderstandings among the general public. "One has to differentiate between simple and complex carbohydrates. Also, people tend to use carbs when they mean white rice, pasta and bread, but fruit and vegetables are healthy, and they are absolutely carbs, so sometimes the terminology isn't appropriate in context," he says. Diet is never going to be like any other area of science. Whatever we've read, whatever the competing theories, whatever the weight of opinion, every individual is effectively conducting their own solo pseudo-scientific experiment in eating. People will endorse whatever keeps them thin. And people will get their dietary tips from other ordinary people as much as they ever do from doctors and nutritionists.